Favorite Book: "Star Wars: Use the Force Luke!" It's a phonics book he got from Santa for Christmas. Favorite TV Show: "Bobby." He watches Bobby's World from 1990 with his daddy on Netflix. Favorite Food: No hesitation, "Chicken and fry fries and ranch and ketchup." Favorite Song: "It's still I Want to Be a Christian." Favorite Thing to Do Outside At Home: "Golf, golf, golf. My favorite is golf." Favorite Thing to Do At The Park: "Swing, mommy, swing!" 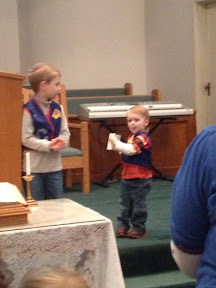 Here's my big boy last night at AWANA. Cubbies are in charge of holding the Bible for the pledges and it was his turn. Instead of holding it down like usual, he said he had to hold it up so the kid could see it, haha. I'll finish up with some recent quotes from Tristan. "Mommy, your shirt has holes in it." The trim around the neckline is like a looped ribbon. He sticks his fingers in the holes. "Mommy, the holes have boobies in them!" "Oh, honey, GG doesn't feel good." "I'll pray for you GG." So serious. "Mommy, when it gets warm I'm gonna go to Uncle Butchie's house and ride the commoda!" He meant Kubota! Uncle Butchie has a farm and Tristan likes to go riding with him when we visit.